What was a muted overnight session, with traders wearily awaiting today's earnings from JPM and Wells, officially starting Q1 earnings season, and with mixed Asian equities prompting a nervous start in Europe, a sharp rebound in Chinese trade data coupled with a surge in Chinese credit creation, bolstered risk assets across the board, helping underpin "signs of resilience" in the global economy, and prompted a broad bid for risk. As a result, S&P futures rallied sharply back above 2,900, the highest since September 2018m ahead of the first major bank earnings in this cycle. However, the catalyst for the spike in futures and sending the S&P sharply higher from 2894 to above 2,900 what China's release of far stronger lending growth, signaling a further firming of its nascent economic recovery. 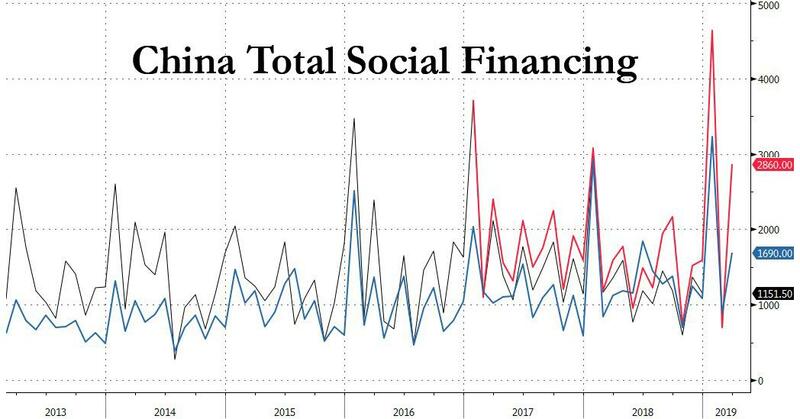 The PBOC reported new yuan loans of 1.69 trillion, far above 1.25 trillion estimate, while total aggregate financing in March soared higher 2.86t yuan, the highest March increase on record; smashing the 1.85t yuan estimate, and more than four times the February 703BN yuan increase. In total, March M2 rose +8.6% y/y; also stronger than the est. +8.2%, and well above the February +8%. 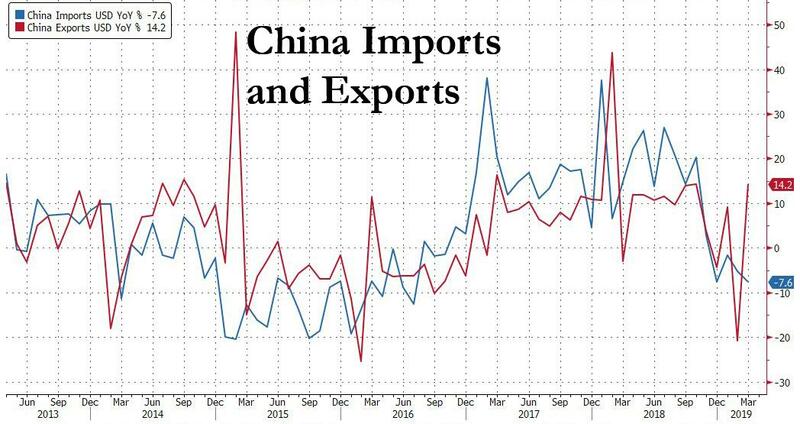 In other words, it once again appears that China is doing everything in its power to flood the economy with new credit and reversing concerns from the sharp February TSF drop. China's gift to markets, and the shift in sentiment came hours before the first-quarter reporting period begins in earnest Friday, with results from JPMorgan Chase & Co. and Wells Fargo & Co. The 10-year Treasury yield climbed above 2.54% and the greenback weakened versus most major currencies, particularly against the euro.